I've been broadcasting a couple of messages about Ontario's electricity exports: that only the IESO can accurately report on the revenues, and that exports at negative prices are not allowed under market rules. It now seems neither of those is correct. Not only can export revenues be calculated, the analysis of export volumes, and revenues over time reveals benefits of markets, and trade. It's not at all clear Ontario's electricity powers understand the benefits. I was recently alerted to a claim that the export revenues could be calculated from Intertie Schedule and Realtime Market Price reports. If that sounds confusing it'll gets worse before I'll try to ease off the jargon. As the Intertie Flows reporting is hourly, and the Realtime Market Price reports in 5 minute intervals some data manipulation is required to match the data sets. The IESO has posted annual files (.csv) with values from each of these reports for 2010 through 2016. To dispatch with the technical talk in one confusing swoop, I'll simply note that averaging the "ENGY" rate by delivery hour for each control area in the Realtime Market Price reports, and multiplying that by the "OFFT" value in Intertie Flows report for the same control area does result in the annual figures the IESO has released either to the Office of the Auditor General or in response to Freedom of Information Requests. I can now extend my work from a previous post to include 2016 data. Having worked the data down to the hourly time-frame by control area I can additionally summarize revenues, and costs, by jurisdiction. The results have some important messages about trade - as each "control area" has a separate market control price. I won't discuss imports much in this post because there's nothing new to discuss. Most imports into Ontario are now from Quebec (over 82% since 2012 began), and those are valued in the new analysis almost exactly as the typical Hourly Ontario Energy Price (HOEP) valued them. Messages about trade from this analysis may be hidden by the realities of communicating summaries of very large data sets. I posted some graphics on hydro(electric) generation by river system, and I received an e-mail from somebody who likely wanted to pursue a story, asking if the data was public knowledge. It was every bit as much public knowledge as what I am writing on today - summarized from hourly data captured from IESO hourly reporting since 2010. However, as most can't process the hourly information, and an official source had not published a summary, it wasn't the basis of a story. I think publication of a summary by an official source is what is required to be considered "public available". 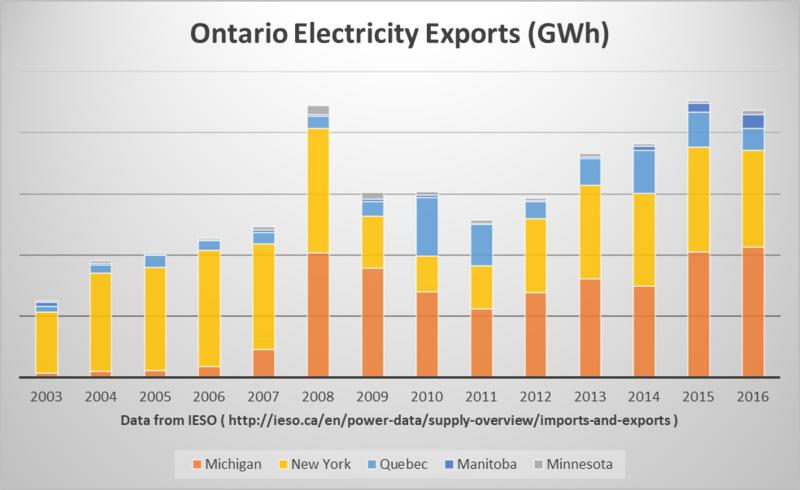 "Ontario's electricity market generated over $20 million in April by exporting electricity to other states and provinces, bringing total net export revenues to over $75 million this year. [my] figures on export sales are estimates based only on the [Hourly Ontario Energy Price] ... in actuality export customers pay different rates. 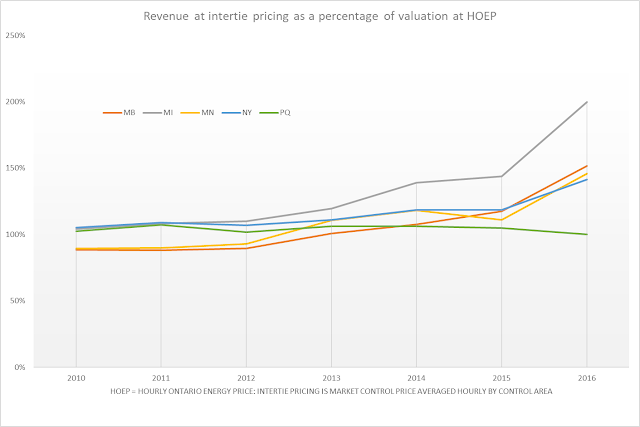 Because Ontario's market pricing is lower, sometimes much lower, than adjacent jurisdictions, it appears from both the ministry 'news' releases, and National Energy Board reporting, we generally export power about 10% above the HOEP rates. 10% was the assumption I had when the IESO ceased summary reporting, but with the base data now summarized, I now know that assumption became wrong as they moved up and up, to nearly 70% above HOEP valuations by 2016. Nearly 70% more than $13.68/MWh is still only $23.09/MWh, but it's better than I expected. The improvement should not, upon reflection, have been unexpected. 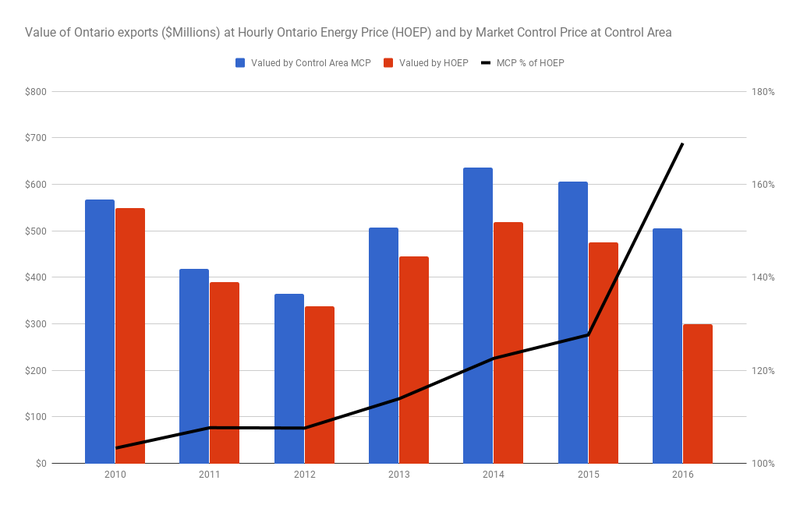 Early in 2015 I wrote Ontario is the sucker of first choice for off-price electricity, in which I tried to explain both excess contracted generation and net revenue requirement contracts contribute to low Ontario prices which provide a good arbitrage opportunity for cross-market traders. I now see that I had clued in only after the profits on that arbitrage peaked (in 2014). As more traders became aware of the opportunity it is not surprising the price for exports rose increasingly above the price for the Ontario market. The improvement is not consistent across all export jurisdictions. This too could have been anticipated. Quebec is a government monopoly on an electricity system featuring enormous reservoirs - they are active in Ontario's markets, but needn't pay more than Ontario's going rate. Manitoba has a similar structure to Quebec, but is connected with a large market as a participant with the Midcontinent Independent System Operator (MISO). MISO has zonal pricing so it is not surprising exports to Minnesota and Manitoba move similarly. New York's ISO (NYISO) manages a market sized similarly to Ontario's. Michigan is within MISO's larger realm, and it has been the largest export market. The largest market for exports attracting twice the average Ontario price is what led to export revenues being well above my expectations last year. It must be remembered the average sale was still under 3 cents per kilowatt-hour, making it far below what Ontario has contracted any supplier at (even hydro), so the point is only that trade reduced losses - but losses that would otherwise be tagged onto the global adjustment. During 2015 and 2016 the average export value to Michigan was 1200 megawatts: the IESO lists the limits for Michigan exports, outside of emergency conditions, as 1700 MW in summer and 1750 in winter (Table 4.3). If we treat the export lines as generators, the capacity factor is 69% - which some would call baseload. MISO is not the largest market in the region: the largest is PJM. Ontario does not currently connect directly to PJM but the opportunity for trade is great enough that an independent company has planned to construct a 1,000 MW cable under Lake Erie. The recent Michigan history shows why this could be profitable for all, and a benefit to Ontario consumers in reducing losses on exports. The Lake Erie connector project now has all approvals, and now construction awaits "securing favorable transmission service agreements with prospective counterparties." Again, Ontario's export experience with Michigan may demonstrate why that is an issue. The little detail I did find on the outages  indicated an ending early in October, but it's Mid-November and exports indicate there remains an 850 MW reduction in the intertie capacity. More communication would have been nice. Ontario's system operator has been actively working with the NYISO to allow Ontario capacity to bid into New York's capacity auctions, but it's hard to find credibility for similar arrangements into MISO given the fragile connections into that market territory. concept of meeting demand needs in Michigan's Upper Peninsula with new transmission proposed out of Ontario at Sault Ste. Marie. Gas engines were selected to provide capacity to the region. It is not clear to me what the IESO can do to improve intertie performance as I assume it is Hydro One's equipment. It is clear to me they don't tally up the damage to Ontario ratepayers from the outages. At the real-time market pricing average of 2016 the 2.6 TWh drop in exports to Michigan in 2017 represents a $75 million revenue loss to Ontario's system - this as curtailment of contracted supply rises, particularly in the IESO's "West" zone which connects to Michigan. The ITC Lake Erie Connector proponents will have to reflect carefully on what "counterparties" they need to secure contracts with for their project to be successful. The IESO does talk a lot about markets, but if Hydro One is responsible for the outages with Michigan, ITC would be wise to make that contract their primary concern north of the lake. Without the wires functioning, markets aren't of much use.